If you have never used dentures before it is expected that you will have several questions regarding your new replacement teeth and the process required to have them fitted. We hope this information helps you understand the process, however please remember you are very welcome to come in for a free consultation in order to ask as many questions regarding this process. Our aim is to help you feel confident and comfortable throughout the whole experience. Often when people start wearing dentures they will begin with a partial plate, then slowly over time additional teeth are added until eventually it is determined by the dentist or prosthetist that a full plate is more suitable for you. Sometimes due to illnesses or significant decay a full denture is prescribed straight away. While Implants are the gold standard in tooth replacement the need for viable jaw bone combine with significant cost can make dentures a more realistic option for many thousands of patients. Removable dentures have been around for hundreds of years and the methods of providing these to patients have been perfected over time ensuring you the best possible fit and function. How will they feel ? When patients have not worn dentures before they often report that they feel quite strange, commonly likening it to having a “mouth full of marbles”. Because so much of what we notice in the mouth is on a sub conscious level, once the denture has been in place for several weeks a lot of what feels very strange and foreign fades away. Patients soon report not being aware of wearing the dentures at all. Once the subconscious brain kicks in, wearing dentures is more comfortable and less obvious to the wearer. Will they affect my Speech ? Even if you have worn dentures before they may be uncomfortable at first and you may find your mouth needs time to adapt to them. Sometimes certain words may be difficult to pronounce at first . The best way to speed up this process is simply to talk a lot ! If you struggle with this, a great way to assist is to read out loud for an hour or two a day during the first few weeks. It even helps to count from 60 through to 70 out loud. Phonetically these sounds are quite difficult to make – counting out loud helps the tongue relax and get used to making these sounds in a more natural way. It is quite common to sound a little lispy when you first get your dentures. Again after a few weeks this should all settle down on its own. If you find your dentures “click” when you talk try to speak a little more slowly and if your dentures slip when you are talking, bite down gently to reposition them and then swallow. This creates suction on your plate and allows your tongue and cheek muscles to keep it in place. When you receive your new dentures the Prosthetist will show you how to place and remove yourdentures. This should be an easy process and you should never use excessive force to remove your denture or partial plate. If you experience any difficulty you should discuss this with your practitioner. When dentures are new they are designed to be as tight as possible in order to achieve the best possible fit. As a result many patients find this a little uncomfortable for the first few days. We always encourage our patients to wear the dentures all day for the first 3 days. We are reluctant to do any adjustments in this time. This is because many of the irritation caused by the new tightly fitting plate will subside on its own and if we adjust an area that will otherwise settle down if left alone for a few days we will lose some of the fit that we work hard to achieve. If however after 3 days you are still experiencing discomfort you will need to come in for an “adjustment” as any sore spots or tenderness that exists beyond three days will generally not settle down unless modified. 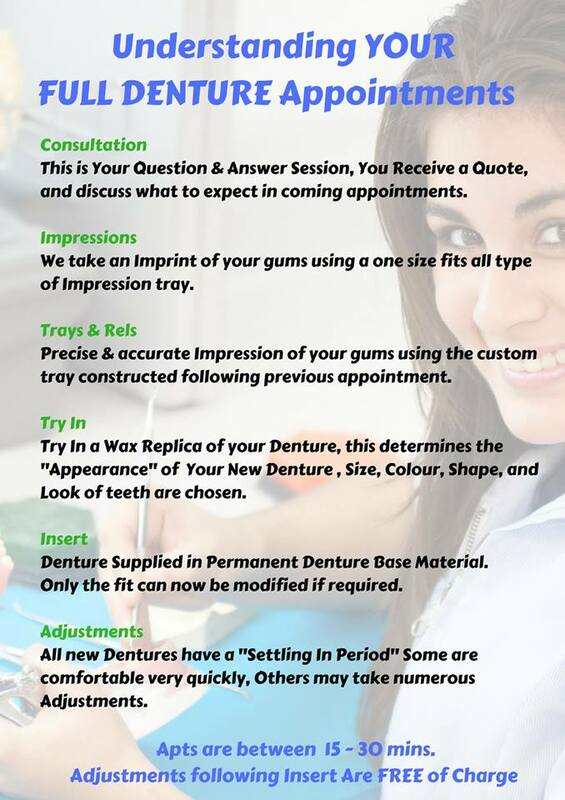 Getting your new dentures usually involves a few appointments – please click on the picture to view appointment categories.  Partial plates are usually just 2 or 3 appointments. Full dentures can take 5-6 appointments. Immediate are generally 1 or two appointments. Regardless of what type of dentures you wear, relines are a crucial and important part of wearing dentures – please follow the link to our Denture Relines page to understand what a reline is as this will dramatically affect the success of your denture wearing journey.